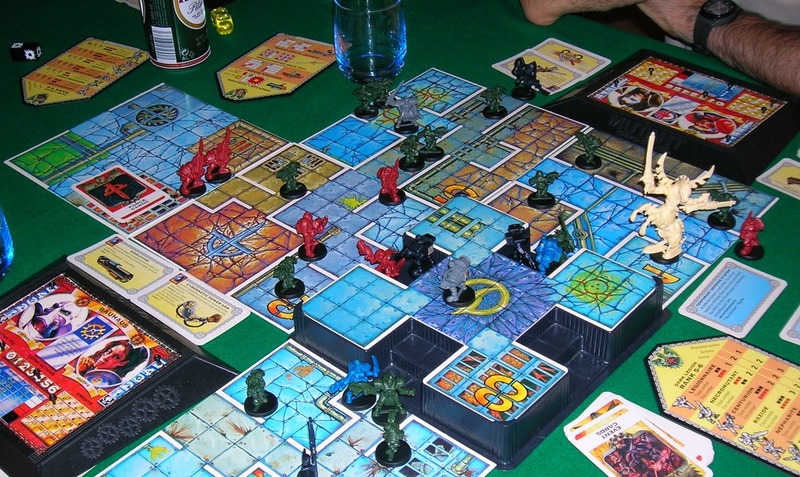 Quinns: It’s the week of Spiel, Germany’s largest board game convention! Break out the bratwurst. Paul: Keep calm and curryworst… on? Quinns: I wonder which games will have stollen our hearts by the end. Paul: Let’s talk card games over kartoffelpuffer. Print runs and fischbrötchen! Quinns: Are you just looking at the Wikipedia page on German food? Quinns: Well nevermind that! I want to tell the people about my most-anticipated Spiel releases! 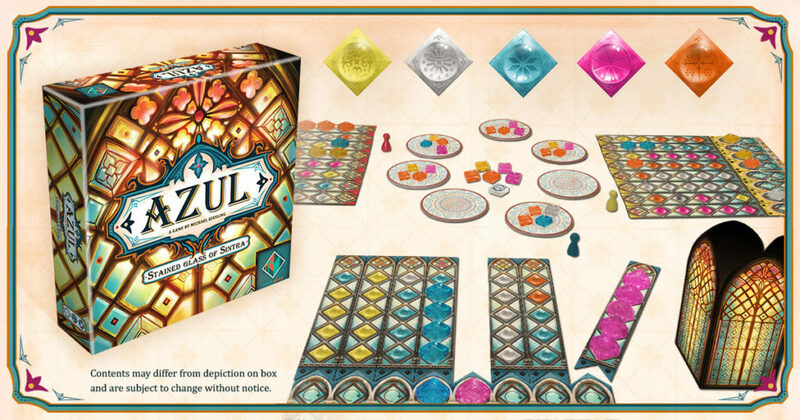 We don’t usually do this, as guessing whether a board game will be good from its marketing materials is about as accurate as Romans predicting the future using entrails. But hey! What’s a bit of blood-flecked divination between friends? Unusually for me (but perhaps fittingly for Spiel), two of the three games I’m excited about are designed by Uwe Rosenberg, who’s best known for Agricola. In the past the pattern has been that Rosenberg designs a heavy game, then whips up a lighter, 2 player version of it (e.g. 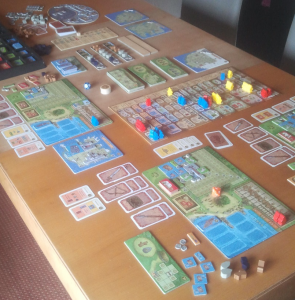 Agricola: All Creatures Big and Small, or Le Havre: The Inland Port). This year we’re seeing the opposite, with two chunky games apparently inspired by his stitched-up 2 player smash hit Patchwork. 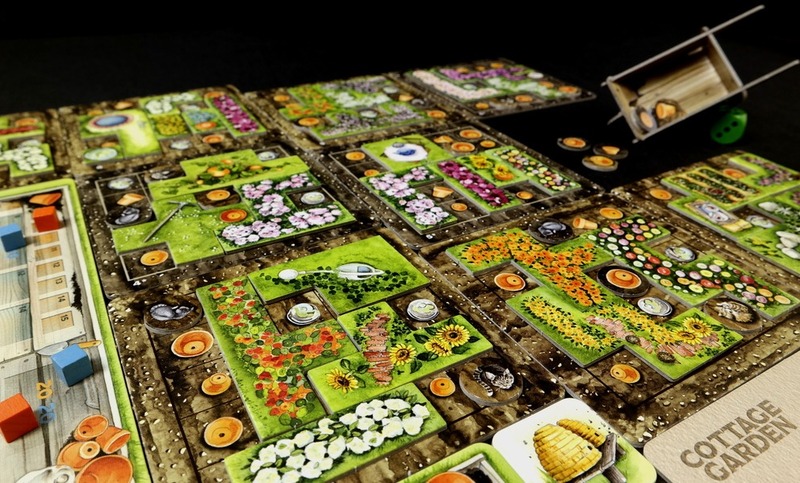 Cottage Garden takes the tetrominoes of Patchwork and fattens the game into an hour-long experience for 1-4 players. Players move their gardener tokens around a central market board, competing for tiles to fill out their personal garden boards, but this time around your personal boards have features that you DON’T want to cover up. The game looks strong, but the real reason I’m excited is how beautiful this theme is. Strawberry patches! Hedgehogs! Teeny tokens showing sleeping cats! All of it brought to life in watercolours, if I’m not mistaken. I’m thrilled to bits that someone’s realised that part of the thrill of Agricola and Caverna is their bucolic nature, and wants to try doubling-down on that. A Feast for Odin is yet another game of fitting awkward items into a personal grid, though this one’s the biggest game of all with a gigantic, Caverna-sized box and a game that clocks in at two hours long or eight games of Patchwork. Really, this time around the grid seems like something of a sideshow. Players are covering up squares on their grid, refining resources into weapons and ships and launching raids. In other words, it’s quite the exciting prospect. We haven’t looked at a game this big since Star Wars Rebellion. My third choice is more unusual. Gentleman’s Deal hasn’t gotten much press, but being a “diplomatic party game about sharing money” it’s up my alley like a length of drainpipe. Players are cast as the influential residents of a small town. 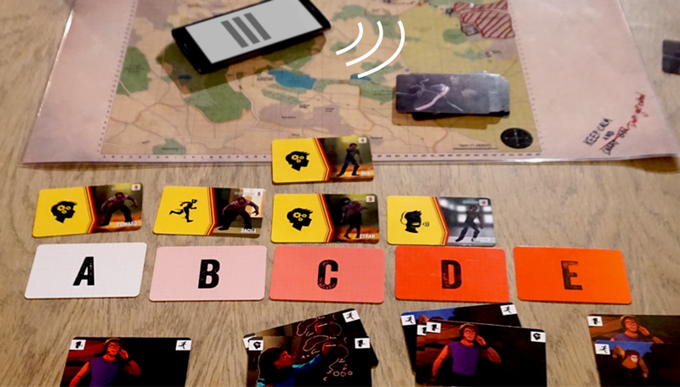 Each turn one player is the dealer and draws a card with a secret amount of money on it, and then must offer each other player an amount of money from the card. These players then vote. If the majority of the table votes in favour of the crime, the money is shared as promised but the dealer takes everything that was left over, which could be a fortune. But if the majority of the table votes the crime down, nobody gets anything and THE DEALER GOES TO PRISON. Throw in a load of other rules to do with special contacts and gangs and you get something I desperately want to try. Will Gentleman’s Deal be the Sheriff of Nottingham of 2016? I certainly hope so. If you’re looking for still more stuff to get excited about, a lot of people are talking about The Oracle of Delphi and Great Western Trail. But what are you guys excited about? Let us know in the comments! Quinns: This RPG Kickstarter caught my eye this week. It’s not just that Mashed looks like a nicely produced book and a well-playtested game about being a doctor in the South Korean war (although I’m head over heels in love with the surgical sheets and the map). It’s that this is yet another case of modern role-playing delivering a setting and rules that are so new and exciting to me. At the risk of sounding like I am one million years old: What will they think of next? Paul: I liked Alan Alda when he was in The West Wing. Even though, by then, The West Wing had gone a bit funny. That’s probably about the extent of my M.A.S.H.-related thoughts, I’m afraid. Quinns: I bet you have one or two excited thoughts about the forthcoming expansions for Steam Park that are going to be shown off at Essen. They include new VIP customers, sorry, VIR (Very Important Robot) customers who must be catered to, new espionage dice and ride expansions. 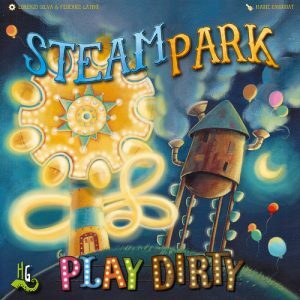 We both thought Steam Park was a charmer, though you probably notice that I don’t find I’m playing it so much any more. Will a chunky expansion change that? Maaaybe. 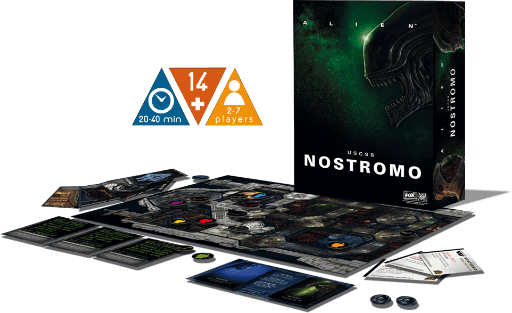 I do want to do the rules explanation again, though, just for the reveal where you tell your friends that their robot guests will be vomiting constantly. Have you heard the news of tthe Zombies, Run! 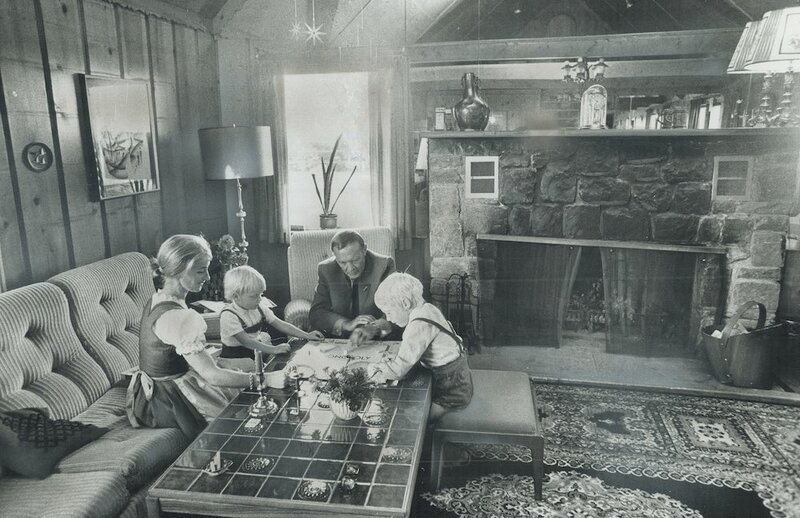 board game? A few people out there might know Zombies! Run as a smart spin on running apps, giving your fitness a narrative that makes it way more interesting and way more urgent. I have to admit that, years back, Zombies! Run was something I always meant to finish a freelance feature on but never did. Now is my chance to finally say, in print, that it’s a great idea. And this looks like a great adaptation! Fittingly, this is another game supported by an app, but it also looks like you’ll be scribbling over that laminated map you get, since the game will remember choices that you make and gradually change the world that you play in to reflect this. It’s a legacy game, too! It has an app and a persistent, ongoing narrative! Our hobby gets more and more exciting every year. Quinns: That said, we’re always hesitant to recommend you guys back a Kickstarter made by anyone with no experience designing board games. If Zombies! Run is great, we’ll let you know in the distant, entrail-splattered future. Quinns: Yes! What’s pretty interesting is that Fantasy Flight has acquired the publishing rights. 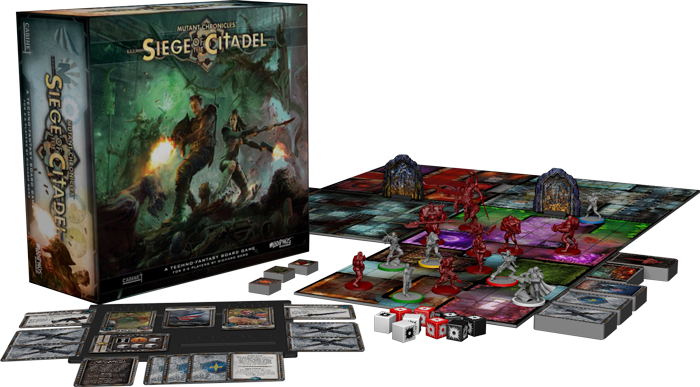 Previously, traditional publishers had been watching from the sidelines as these miniatures Kickstarters scooped up cash. Now it seems that they’re getting involved. Paul: It makes perfect sense, too. The sums of money floating around Kickstarter these days are an order of magnitude larger than they were even just a few years ago. That’s impossible to ignore and not a Games News goes by without us wondering whether to cover that month’s success stories. I’m never going to balk at increased distribution, either, because the classic problem with Kickstarters is that they’re so often a print run limited to a group of people who have… already purchased the game anyway. Quinns: Before we move on, can we post a photo of the original Siege of the Citadel? Quinns: Yeaaaaah! Doesn’t it make you want to put on a Megadeth CD and pour yourself a Fosters? Paul: HAPPY BIRTHDAY! I got you a sense of longing for a glittering youth that may never have existed. I want to stay with the subject of distribution just a little bit longer and link you to Plaid Hat’s recent State of Ashes address. Despite gaining some very ardent fans, it looks like Ashes hasn’t taken off in the way Plaid Hat had hoped and, while they talk about a couple of contributing factors, including some rules clarifications and sorting out organised play, what really stands out here is the supply and demand issue. Plaid Hat owners F2Z can’t keep up with demand and Plaid Hat “have been unhappy with the fulfillment company we have used in the EU for the latest Ashes shipments.” I’m increasingly hearing from both brick-and-mortar retailers and small-to-medium-sized publishers that distribution is the one of the industry’s biggest headaches as it grows and grows. No game can be a success if you can’t get it out there.